Ardbeg Islay Malt will be delivered with a suitably wild roar to whisky fans across Europe this summer with the arrival of the Ardbeg Chopper. The eye-catching motorbike has been specially custom-built by cult US manufacturer Orange County Choppers ahead of its adventure. Established in 1815, Ardbeg embodies the untamed ruggedness of the wild western Scottish island of Islay where it is produced. Devotees worship its memorably smoky flavour, which has seen it judged Best Scotch in the World in 2008, 2009 and 2010. 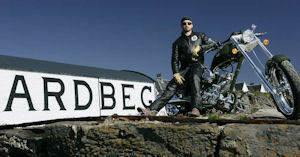 The Ardbeg Chopper pulled into its spiritual home on at the Ardbeg Distillery on Islay before it sets off across Europe. The Ultimate Islay Malt gets aboard the equally iconic and free spirited Chopper motorbike to bring new fans to its devoted global following. The Ardbeg Chopper bike will be pulling in at bars, whisky shops and festivals in Sweden, Norway, Denmark, Finland, Belgium, Netherlands and the UK. Fans of the Ultimate Islay Single Malt will be encouraged to pose with the Chopper and sample a dram of the award-winning Ardbeg 10 Years Old. As part of its European odyssey the Ardbeg Chopper will begin its tour at Glasgow airport and after driving 2,000 miles across Europe will eventually return home to Ardbeg Distillery. Rachel Barrie, Whisky Creator and Master Blender, at The Glenmorangie Company, said: “Ardbeg is the free spirit of our whiskies. It is the embodiment of the big, powerful beauty of Scotland’s wild western isles where it is produced. The Ardbeg Chopper bike is the perfect way to bring together two icons and win over new fans to our whisky. The brand’s thousands of Facebook and Twitter followers can follow the Chopper as it tours across Europe thanks to regular photos and updates. Fans should log on to www.ardbeg.com for more information.